Rare example of this lovely map with an elaborate decorative border. Identifies the phantom island of Borodon or St. Brendan. L'Amerique Septentrionale Suivant les Nouvelles Observations de Messrs. De L'Academie Royal des Sciences, etx. 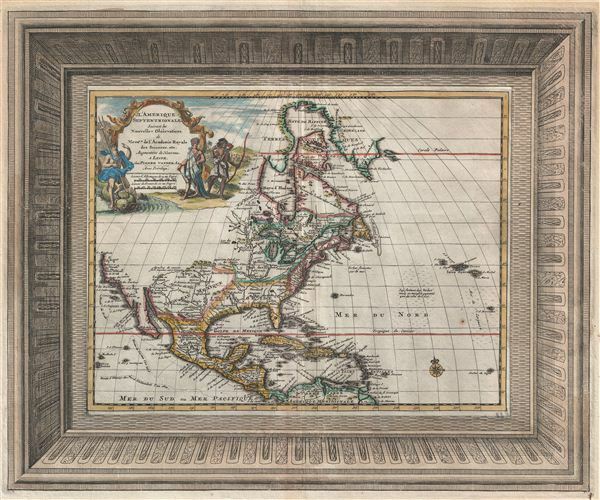 A fine 1729 map of North America by Pieter Van der Aa with an elaborate frame style border. Centered on the Great Lakes, this map covers all of North America from the Baffin Bay to the Spanish Map and from California to the Azores (Acores). The map is color coded according to the dominant colonial powers; the regions of Florida, New Mexico, New Spain (Mexico), California, Nouvelle France, the lands of the Hudson Bay Company, and the British Colonies along the eastern seaboard being identified. The western and northwestern parts of the map are largely blank or hidden behind the large allegorical title cartouche; however there are some interesting elements nonetheless. These include a rare, somewhat accurate mapping of Quivira in the center of the continent – earlier and later maps move it westward into New Mexico. Parts of California are identified as New Albion following the english convention. To the west of Mexico, exploratory routes used by d'Oliver, Cortez, and Drake are ghosted in. While this map is not exceptionally uncommon, examples with the distinctive frame style border, as seen here, are exceedingly rare. This border design is a characteristic trademark of Van der Aa's 1729, Galerie Agreable du Monde, a staggering sixty-six volume atlas issued purportedly issued in only 100 copies. While maps from this atlas do occasionally appear on the market, they are all exceptionally rare – especially those that focus on highly desirable areas such as North America. Pieter van der Aa (1659 - 1733) was a Dutch publisher of maps and atlases active in the late 17th and early 18th centuries. Van der Aa was born in Leyden in 1659. At nine he was apprenticed to a local bookseller and, by 21, had established his own publishing, printing, and auctioneering house. In 1692 Van der Aa was appointed to be one of the High Commissioners of the Booksellers Guild. During his long and impressive career Van der Aa produced thousands of maps, including a vast 28 volume atlas containing no less than 3,000 maps. Few of Van der Aa's maps were original productions, most being copied from the work of earlier cartographers. Nonetheless, when one of Van der Aa's rare original pieces does appear, his style, with unusual projections, elegant engraving, and precise detail, is instantly recognizable and highly desirable. He also pioneered the cartographic idea of separating border artwork from the map plate itself such that every map in a collection could have a similar elaborate border without actually having to re-engrave the complex plates. This technique was used to great effect by later 18th century publishers like Brion de la Tour. Following Van der Aa's death in 1733, his much admired Nouvel Atlas was reissued by the Dutch firm of Covens & Mortier. Today Van der Aa's work is admired for its fine delicate engraving and unusual projections and is considered highly desirable among collectors. Van der Aa, P., Galerie Agreable du Monde, 1729. Very good. Some staining to outer top margins relating to primitive framing work. Else a very clean example. Original centerfold. Blank on verso. Van der Krogt, P., Koeman's Atlantes Neerlandici, Aa6.